On Halloween, shape these cheesy crackers into creepy witch fingers, by pressing a sliced almond onto the end of each one to make the nail. During the rest of the year, roll the dough into logs and cut them into coins before baking. In a food processor, grate the cheddar cheese. Add the butter, salt, and cayenne, and process until smooth. Add the flour and pulse until incorporated. Turn the dough out onto a work surface and knead until smooth. Divide the dough into 36 pieces and roll each piece into a 4-inch finger. Arrange the fingers on 2 parchment paper–lined baking sheets and brush with the egg wash. Press an almond slice onto the end of each finger to resemble a fingernail. Refrigerate the cheese fingers until firm, about 15 minutes. Preheat the oven to 350 degrees F. Bake the cheese fingers in the upper and lower thirds of the oven for about 25 minutes, until puffed and golden, shifting the pans halfway through baking. 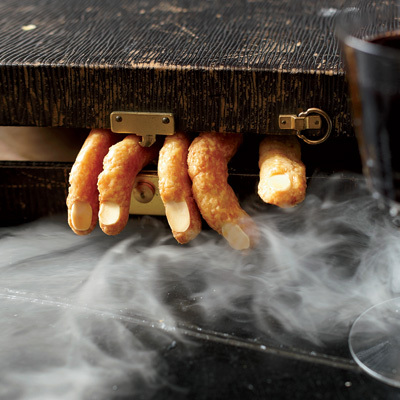 Let the cheese fingers cool completely, then arrange on a platter and serve.